Ponte Vedra Plastic Surgery will ship your product purchase to you. Only $6 shipping and handling. A new way to cleanse! Clarisonic is the newest way to effectively remove make-up, dirt and oil without harsh scrubbing or damaging of the skin. For more information on this cutting-edge cleansing technology, please take a look at the Clarisonic web site for information and photos. Contact us today to purchase your Clarisonic Pro Spot Therapy Brush and begin looking younger and smoother! Plus Spot Therapy for the Body! What is LATISSE™? LATISSE™ solution is a prescription treatment for hypotrichosis used to grow eyelashes, making them longer,thicker, and darker. Eyelash hypotrichosis is another name for having inadequate or not enough eyelashes. How does it work? LATISSE™ is believed to affect the growth (anagen) phase of the eyelash hair cycle in 2 ways: first, it increases the length of this phase; and second, it increases the number of hairs in this growth phase. The exact way it works is unknown. How soon will I see results? The onset of effect with LATISSE™ solution is gradual. In clinical trial, the majority of LATISSE™ users saw a significant improvement by 2 months. How is LATISSE™ different? Only LATISSE™ has been approved by the FDA as a prescription treatment for hypotrichosis used to grow eyelashes. It also has been studied in clinical trial to demonstrate its safety and effectiveness. 1. LATISSE™ Prescribing Information. Click here to download a PDF brochure of Latisse™, the only FDA approved prescription product for inadequate or insufficient eyelashes. Visit the Latisse™ web site for more information or contact us today to purchase this product. 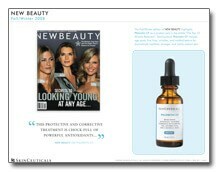 Click here to see more about SkinCeuticals featured in the media! There’s a reason that the TNS Essential Serum courtesy of SkinMedica is coined as essential… it does everything and we mean everything! Okay, okay, it might not do the dishes, but that is pretty much where this miracle product draws the line. It tightens, brightens, and even aids the skin renewal process. Translation: it helps the skin naturally regenerate itself. How cool is that? We are calling it the starfish effect. It’s as close to having a fountain of youth in a box as we have seen, because lines are all but eliminated. Our thoughts? Go ahead and have a crazy night out on the town, because this recovery complex will have you looking brand-spanking-new in the morning. A potent cocktail of extracellular matrix building amino acids, hydrolyzed silk, and human fibroblast conditioned media literally turns the tables on that mean old man, Father Time. And we think this product is so cool to use. There is a dual chamber, so no matter what happens, you just feel like you are trying harder. One chamber utilizes the APS Corrective Complex to protect against free radicals. 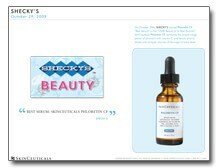 In reality, we found that these powerful peptides gave us a serious glow factor. The other chamber uses the TNS Recovery Complex to even out tone and texture while improving elasticity. All we know is this… if you are searching for a superhero for your skincare regime, then SkinMedica should definitely be in your arsenal of defenses! Sunforgettable: Achieve the ultimate protection from sun damage and its aging effects with a soft focus finish. Sunforgettable sunscreens are easy to apply and reapply throughout the day to keep your skin protected and beautiful. Sunforgettable SPF 30 highly refined mineral sunscreen provides safe, non-irritating, UVA and UVB sun protection. The self-dispensing powder brush makes it easy to apply and re-apply throughout the day for continued coverage. Sunforgettable Lip Shine SPF 35: Protect your lips 365 days a year while still looking beautiful. Give your lips a tint of colore while shielding them from the sun’s harmful rays with Sunforgettable Lip Shine SPF 35 with Broad Spectrum UVA/UVB sun protection. Primer: It’s all about what’s best for you. Our award-winning range of custom-created face primers provide sun protection, diminish fine lines and pore size while achieving the skin texture, tone and finish you desire. Foundation: Provides medium to full coverage with a weightless, non drying feeling on the skin. It gives the appearance of perfection without the thick look of traditional pressed powder. Our pure pigments are designed to glide on smoothly for the perfect colore. Mineral Corrector Palatte: Our Mineral Corrector Palette has got you covered. This unique palette contains five complementary colores, giving you multiple options for use. Each colore can be used separately or blended together to camouflage everyday skin concerns, such as blemishes, dark circles and redness, as well as post-procedure discolorations. The intense pigments cover and correct without apparent texture, providing natural looking coverage. Beauty on the go: This essential, all-in-one, multi-use mineral palette contains everything you need to look fresh faced and radiant within minutes. Warm pinks and browns flatter any skin tone and can be transformed from a simple daytime look to a dramatic look for night. Perfect for face, eyes, lips and cheeks. unnamedSetting Mist: Refresh your skin with Colorescience Hydrating Setting Mist. This moisturizing mist is formulated to soothe and replenish normal to dry skin. It protects against dehydration and helps to restore the look of flaking and peeling skin.